Do front fairings have an advantage for upright bicycles? I wanted to know if anybody has experienced increase in speed/reduction in air drag with a fairing [with an upright hybrid]. I saw the body of F40 bike(http://www.lightningbikes.com/f40/) and I was wondering if such an aero design exists for upright bikes and if doesn't, exist would making such a aero design for upright bike worthwhile? or in this thread which shows some more aero style fairings. If you want to go faster, get a more aggressive road bike rather than a hybrid and/or pedal faster. I doubt many riders could get a significant advantage from a fairing on an upright bicycle unless they were racing (and if they were racing, they wouldn't be on a hybrid anyway). 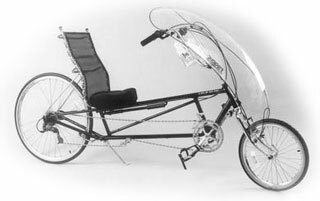 For a velomobile or recumbent, the speeds you can reach are higher to begin with, and the locking problem is already big enough that it isn't too bad to add a fairing. You also have a less of a stability problem (say with crosswinds) than on an upright bike which makes the design somewhat simpler. 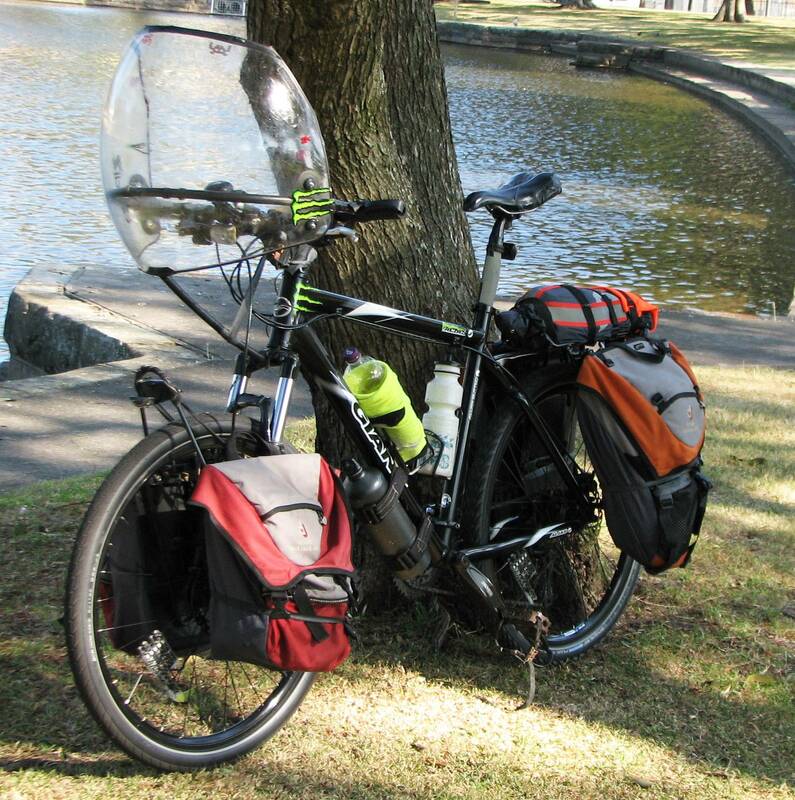 I have read an article regarding partial fairings for upright bikes. It is interesting that a partial fairing will reduce the energy needed to keep the bike rolling at 35km/h while in a fairly relaxed riding position by about 1/4 (220 watts to about 160 watts)!! (Data sourced to David Gordon Wilson, Bicycling Science, 3rd ed., p.188). So the heck with the speed or rain rationalizations: if you want to travel farther and conserve energy in the process (a.k.a. touring), a partial fairing should definitely be considered! Are you trying to block rain or are you trying to be aerodynamic? For rain, a front fairing doesn't do much unless you can get one where you can tuck your head behind while also going fast enough that the rain blows over you. In Japan, I've ridden mom bikes with fairings and can say that they do zilch for rain until you're going at least 20kph or higher. For aerodynamics, fairings can also act like a sail which can lead to considerable instability. 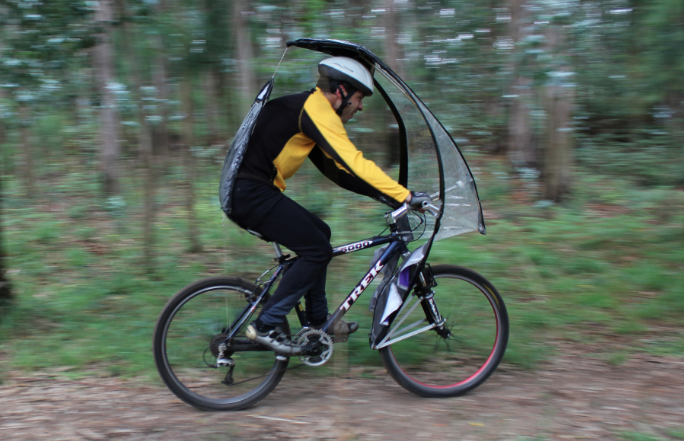 One significantly nice thing on a recumbent is that the fairing will prevent you from eating bugs. Since you're more upright, there is a tendency to consume more than on a road bike where you are facing downwards. If you're planning on an extended trip at high speed (such as a cross-country run) it might be worth it, but otherwise you may find them to be a net disadvantage. Only one way to know though -- try it! p.s. There have been crowdfunded attempts at full fairings but they weren't funded -- I think most people don't think it worth putting something on full-time for something they'd only use on rainy days and which might also block your vision (note lack of windshield wipers). Even bicyclists in Seattle just use rain gear. Zzipper Fairings in the USA make handlebar mount fairings. I've used the same one on and off for 30 years! Great product. So much faster than without. Fairings work, and work well. I had one, about like the Zipper pictured, on a bike I rode from the west side of Bainbridge to Ballard (Seattle area) and back every day for years. Wind was common on that route, and I was wet as often as not. The fairing was noticeably faster, and more comfortable, than the bare bike. Not the answer you're looking for? Browse other questions tagged hybrid-bike recumbent or ask your own question. 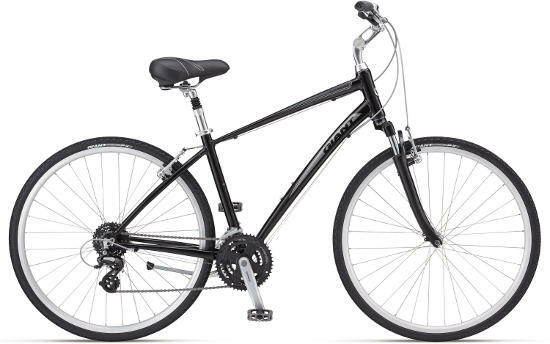 What criteria should I be looking for in selecting a new hybrid bike model?